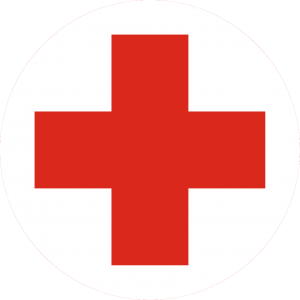 The Red Cross emblem is the image of a red cross against white background. It is used as a symbol of protection during any armed conflict and as a distinctive sign of belonging to the international movement in peacetime. The Red Crescent and the Red Crystal symbols are equivalent to the symbol of the Red Cross. All three emblems have equal status under the International Humanitarian Law and according to the laws of the country in which they are used. The National Society may use one of three logos that indicate its activities. International Red Cross and Red Crescent Movement is the largest humanitarian network in the world. Following the principles of neutrality and inseparability, the Movement assists the victims of emergencies and armed conflicts. The International Committee of the Red Cross, which was founded in 1863, operates all over the globe, helping people affected by conflicts and armed violence, as well as raising awareness on the laws that protect the victims of war. As an independent and neutral organization, it has a mandate which is provided mainly by the 1949 Geneva Conventions. The ICRC is headquartered in Geneva, Switzerland, and employs approximately 14 thousand of people in more than 80 countries around the world. It is financed mainly by voluntary contributions of the governments and the National Societies of Red Cross and Red Crescent. International Federation of Red Cross and Red Crescent (IFRC) is a global humanitarian organization that coordinates and provides international assistance to the places of natural and man-made disasters in peacetime. Its mission is to ensure easier life conditions for the vulnerable people by mobilizing the power of humanity. IFRC cooperates with the National Societies in responding to disasters around the world. RC rescue operations also have a development component, including programs of response to emergencies, programs for health care and protection, promotion of humanitarian values. In particular, the Federation supports the programs to reduce the risks and to combat the socially dangerous diseases, such as HIV, tuberculosis, avian flu and malaria. The organization also combats discrimination and violence, raises awareness on human rights and provides assistance to migrants. 190 National Societies of Red Cross and Red Crescent Societies around the world form a unique network of the International Red Cross and Red Crescent Movement. Operation of each national society is maintained by the professionals and volunteers who provide a wide range of services starting from emergency response and assistance to victims of war and ending with first aid trainings and restoration of family links. National Societies cooperate with the authorities as independent partners, assisting the Government in implementation of the humanitarian policy. Their local knowledge and experience, work with the community and wide infrastructure gives possibility for the Movement to respond quickly to the needs of people and to provide operative assistance. The volunteers of National Societies are often the first to respond to the consequences of emergencies and help the affected people until additional support arrives. A wide network of volunteers and staff plays an essential role in support of various programs that are implemented on a permanent basis. All components of the International Red Cross and Red Crescent Movement – i.e. the International Committee of Red Cross, International Federation of Red Cross and Red Crescent, National Societies – are guided by the same principles in their activities. The International Red Cross and Red Crescent Movement, born of a desire to bring assistance without discrimination to the wounded on the battlefield, endeavours, in its international and national capacity, to prevent and alleviate human suffering wherever it may be found. Its purpose is to protect life and health and to ensure respect for the human being. It promotes mutual understanding, friendship, cooperation and lasting peace amongst all nations. International Movement makes no discrimination as to nationality, race, religious beliefs, class or political opinions. It endeavours to relieve the suffering of individuals, being guided solely by their needs, and to give priority to the most urgent cases of distress. In order to continue to enjoy the confidence of all, the Movement may not take sides in hostilities or engage in controversies of a political, racial, religious or ideological nature. The Movement is independent. The National Societies, while assisting in the humanitarian services to their governments and subject to the laws of their respective countries, must always maintain their autonomy to be able to act anytime in accordance with the principles of the Movement. In its voluntary relief, the International Movement is not prompted in any manner by desire for gain. There can be only one Red Cross or one Red Crescent Society in any country. It must be open to all. It must carry on its humanitarian work throughout its territory.